Chronic stage (striaealba) - pale colored, or hypo pigmented striae. Stretch marks commonly appear in places such as the abdomen, thighs, buttocks, breasts, arms, and legs. Stretch marks are also thought to be influenced by genetic factors. Conventional treatment for stretch marks includes multiple topical creams, oils, and ointments which do not generally deliver the desired improvement of striae patients hope for. 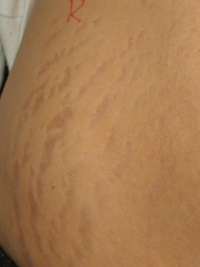 Studies carried out using topical creams showed that certain brands were beneficial in the very early stages of small striae, but did not benefit the later stages.Conventional laser therapy such as PDL technology has demonstrated to be effective in the early stages of development of striae, and is not recommended for all skin types. Patients Medical's highly trained staff utilizes the most current technology available, the Palomar Icon, to help restore the skin back to a healthy state. 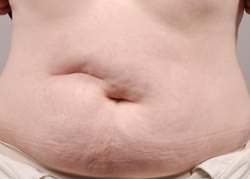 This treatment is ideal for unwanted stretch marks of all stages and severity. The Palomar Icon, non-ablative laser, is FDA approved for the treatment of striae (stretch marks). Safe microbeams are used to penetrate the skin and create coagulation in the dermis (skin). This triggers restoration and collagen production, turning once damaged tissue into healthy tissue, greatly minimizing the appearance of stretch marks. Smooth Pulse delivery is utilized which controls the heat, allowing for comfortable treatment with little to no discomfort. There is no downtime involved, meaning that patients may return to their daily activities immediately after treatment. The Palomar Icon Stretch Mark Treatment is safe and effective for all skin types.